Injuries have ruined the careers of many footballers, and Chris Curran was one of those unlucky ones. 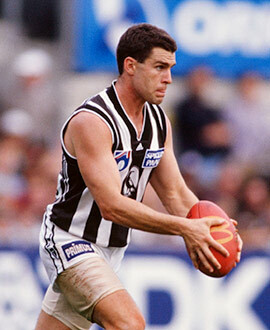 A diligent player who played with a team-first approach, Curran played 34 senior games for the Magpies between 1995 and 1998, and won the club’s Joseph Wren Memorial Trophy as its reserves best-and-fairest in 1994. He was often used through the midfield, where he had the ability to tag a key opponent out of the game or win his own ball and push forward to impact the scoreboard. With better luck with injuries, he would surely have played a lot more senior football. Curran learned his football in Melbourne’s eastern suburbs, where he played juniors with both Boronia and Wantirna. He joined Richmond’s under-19s team during his mid-teenage years, playing for the Tigers’ underage side at the tender age of 15. Richmond added him to its senior list when he was 16, and he finished runner-up in the reserves team’s best-and-fairest despite playing only half the season. Unfortunately a senior berth eluded him – four hamstring injuries made sure of that. Moved on by the Tigers, Curran began training with VFA club Box Hill, only to find out he had been added to Collingwood’s supplementary list ahead of the 1994 season, learning his fate when he picked up his morning newspaper. He won the reserves’ best-and-fairest in that first season, then was added to the senior list through a pre-draft supplementary selection ahead of the 1995 season. He made his senior debut against Geelong in Round 3 and luckily did well enough to hold his place for the next game – and a slice of history, when he ran out for what would prove to be the first of the Pies-Bombers ANZAC Day blockbusters. Curran played 10 games in an encouraging debut season and added a further nine in 1996. Again, that year’s ANZAC Day game provided a pivotal moment, with Curran’s 26-disposal, one-goal performance against the Bombers being his best yet. “It was probably the first time where I felt part of the team, like I had earned my spot in the team,” he said later. “I was tagging Joe Misiti and Mark Mercuri at the time. It was probably the best game I played. Curran was a neat, composed footballer. He was a hard worker who could find the football, but who ended up establishing a niche for himself as a run-with player. He wasn’t a long kick but he usually used the ball well, and while not super quick had enough toe to keep up with the contest. With confidence increasing, he played the first 12 games of 1997 and started in fine fashion, kicking two goals in each of the first two games before collecting 31 possessions (while tagging Robert Harvey) against St Kilda in the third round in a brilliant performance. Everything seemed to be falling into place for him in terms of career progression. It was then that injuries intervened: a run of troubles involving knees, feet, hamstrings and finally a broken jaw against Melbourne’s reserves team in round 17 that ended his season. Remarkably, just a year later – and aged only 23 – the foot and knee problems forced Curran to retire. The foot, it turned out, had been an issue for him since he was 15 and it never healed. The constant pain saw him spend more and more time in rehab and less and less time on the track. He could only play with the assistance of injections. And that was the end of Chris Curran’s still fledgling AFL career. He spent the next year at the club working with the fitness staff before leaving Victoria Park, bound for a career in personal training and later in teaching. He made many friends through football, not just at Collingwood, and they were all shattered when he died in a car accident in Townsville late in 2018. He was just 44 years old.